As host of HGTV’s House Hunters on Vacation, designer Taniya Nayak has seen some amazing homes. She spoke with SheKnows and shared her tips for how you can create yours. Taniya Nayak knows a thing or two about dream vacation homes. The host of House Hunters on Vacation regularly whisks homeowners off to see some incredible homes around the globe. Combined with her experience as a designer on the budget-friendly Designed to Sell, we thought she’d be perfect to chat with about creating your own dream vacation home (even if it’s at your very own house). SheKnows: So you just bought a vacation home. Where do you start when trying to pick out decor? Taniya: Look at the bones of the vacation home and see what you can keep. Because it’s a vacation home and a second house, you don’t want to invest a fortune into making it fancy schmancy. You want to just work with what you have to make it more livable and homey. Bring extra stuff that you have from home and try to dress it up that way. The tricky part is how to make it work to become cohesive so that it’s a place you want to hang in and not a miscellaneous storage room. Are the floors and walls in good condition? Just simply sanding and re-staining a floor can make a place look brand new again. A fresh coat of white paint is a great thing to have in a vacation home just to make it feel fresh and bright. In short, keep it simple and keep it clean. SheKnows: If the house is by the ocean or is a woodsy cabin, should you embrace that theme when decorating the house? Taniya: Absolutely! Keeping your style in relation to the location is the case for any home, not just vacation homes. If you have a log cabin, bring in more woods and rustic-type features. If you’re in a beach home, then jute rugs, white couches and more natural elements are a great way to go. SheKnows: What are the best colors for a vacation house? Taniya: This is one of the reasons I think white is a good base, because you can bring in colors for different rooms through your bedding and window treatments. In this case, anything goes. In Miami you can do chartreuse green with pops of yellow. If you’re in the Caribbean, do teals and greens and maybe accent with a pop of fuchsia. You can be really expressive with accessories because they are a lot more affordable than say wallpapering or getting an antique rug. They’re a lot more fun to play around with. SheKnows: What are some other ways to accessorize a home? Taniya: Vacation homes are great for incorporating things you’ve accumulated from your travels. It’s a nice conversation piece. Things that are local to the area are always great. Also, think about revamping something you already have. You can take an old, ornate mirror and spray paint the frame with white lacquer. A yellow lacquer would be a great way to make it fun, poppy, colorful and more modern. Revamping stuff you already have — giving old furniture a coat of paint — is a nice way to reuse stuff and freshen it up for a vacation house. SheKnows: OK, you splurged on purchasing a second home, but now you have to be budget-savvy when it comes to the decor. What are your tips for decorating on a budget? Taniya: Again, reusing the stuff you already have and revamping them is the key to saving money. There’s a great product that’s perfect for older places that are more fixer-upper-style (the ones with the old laminate tops). 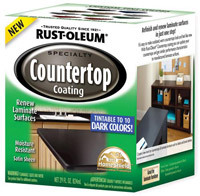 Rustoleum makes an amazing countertop paint that goes right on top of laminate. You don’t even have to sand it, you just cream it on nice, paint right over it and it dries. It’s amazing! It’s great for kitchens and bathrooms. SheKnows: Which is the most important room in a vacation house and why? Taniya: For sure the living room. Outdoor spaces are also an essential part of a vacation home. You really want to put in as much effort to the outdoor space as the indoor space because a lot of the time you’re eating outside, you’re hanging out having a drink, watching the kids play, etc., so spend a good amount of time decorating the outdoors. SheKnows: How can you create a relaxing home away from home? Taniya: One thing that helps is actually having the comforts of home in your vacation house because things that are familiar to you will make it more homey. If you get a new bedspread or blanket or dinnerware for your house, take the old ones to the vacation home. Those are things that can help you feel more relaxed and feel like you’re at home on vacation. Also, it sounds so silly and simple, but having baskets filled with extra blankets and pillows so you don’t have to pack them all the time makes a huge difference. SheKnows: What about always having room for that last-minute guest? Taniya: When you have a vacation home, you better believe that people are going to visit and take advantage of it! And they should come. After all, memories like that are meant to be shared. So plan your sleeping area to accommodate people. Instead of one queen bed, have two twins that can be pushed together. Have air beds on hand. Make sure your sofa is a sleeper sofa. Stuff like this really helps accommodate extra guests because it is going to happen. SheKnows: What about homeowners thinking of renting out their vacation house when it’s not in use? Taniya: First of all, if you’re going to be renting your vacation home to other people, make sure you have a deposit box with a lock on it so that you can put away anything of value while you’re gone. As far as maintenance, I think it’s very important to hire a cleaning service to come in after each guest departs. Incorporate it into your fee for the rental. SheKnows: OK, so we all don’t get to have a second vacation home. How can you make your regular house an instant retreat? Taniya: This is like a reverse to what we’ve been talking about with vacation homes. In your own home, find a spot where you can create that zen, relaxing getaway space. If you love the beach, then bring in elements that you’d ideally do in your dream vacation home, whether it’s a jute rug or white canvas couches and cool blues. Find a theme that you can decorate that takes you away. Find inspiration from a place that you’ve visited whether it’s Morocco, France, St. Martin, Florida or Cape Cod. Look for elements that you love about that vacation destination and incorporate it into the design of your room. SheKnows: We gotta know, what would your ideal vacation home look like? Taniya: My perfect vacation house would be one side facing the water with huge windows overlooking the ocean. I’d have the interior be very crisp, very clean with maybe horizontal boards of wood painted white. I wouldn’t want to overdesign. I would want the inside to be relaxing and fresh so that I really enjoy the views on the outside. Not cluttered. Very clean, very simple, very crisp. Lots of seating. And a big bar. What would YOUR dream vacation house look like? Share in the comments below!